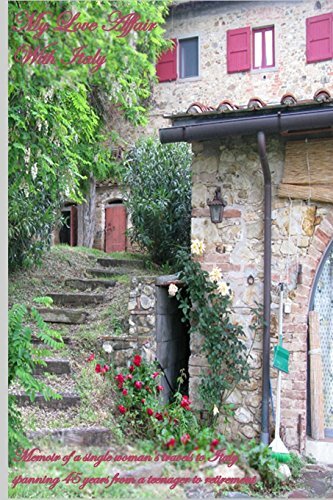 “My Love Affair With Italy” by Debbie Mancuso is the author’s memoir, which focuses on her lifelong love for Italy, but that is not all she shares. Mingled within her travels to Italy is the story of a single woman of 100% Italian descent growing up in New Jersey, her relationships, her love for her father, her troubles with her sister; in short her life from her teen years up through adulthood. The story begins when 17-year-old Debbie sets a goal to visit Italy. She enrolls in a student tour to Italy, France, and Switzerland for the summer after her high school Junior year, with plans to take off right after her 17th birthday. This was Debbie’s first trip, and she was going by herself! The trip was nothing like what she expected. Her journey there had the surprise of a helicopter ride to the airport, as her mother decided to drive her to the heliport instead of going directly to the airport where she was supposed to meet Mr. Zappola and the rest of the student group. Once in Italy Debbie not only realizes that her level of Italian is not the same as the rest of the group, she will also learn a lot more of herself as she gets to discover a little bit of Italy, Italians, and oh yeah, an unexpected event that will have the family worried down to their bones! Debbie Mancuso has a wonderful narrating voice. Her descriptions are so vivid they truly transported me to Italy. Being an Italian who grew up away from Italy myself, I easily related to Debbie. I remembered when I went to Sicily as a 19-year-old and every good looking guy I noticed ended up being my cousin! Of course this made me give up on any idea of a summer romance in Sicily all together. I love how Mancuso presents to readers the Italy I know instead of the ‘tourist Italy’ – its beauty, its flaws, its mysteries and thrills of traveling there…everything that makes going to Italy the adventure of a lifetime. I also liked the fact that this is her memoir from her coming of age years to adulthood, and its different life stages. There are some technical issues that did take me out of the story, however – some were grammar issues, but the main one was the fact that she tells the story in present tense. Memoirs are by concept in the past, so the narrations in memoirs are always in the past tense. Finding the opposite voice kind of threw me off a little, especially in the beginning. The major problem was that I found the present tense jumps into the past tense sometimes, which was confusing to me as I read and thus it would take me out of the story. I think that these flaws could have been caught by a professional memoir editor. Overall, I found “My Love Affair With Italy” by Debbie Mancuso to be a lovely tale of an Italian woman’s love for Italy and life. I do hope the author republishes a revised edition as the story’s telling voice and the stories within deserve it.